#TBT: Serving Size vs Portion Size - Marci R.D. The Concept of “Throwback Thursday” (TBT) is all over social media these days. This past week I have been talking quite a bit with clients about a topic I actually blogged about over two years ago. So here’s to throwing back to an old but still pertinent topic- the different between a serving size vs. a portion size. I hope it’s helpful! Alright, I’m about to get on my RD soap box here. I have a little pet peeve. Ok, sometimes it’s a big pet peeve. Have you ever noticed that popular diet books, magazines, and well-intended news reporters get confused between serving sizes and portion sizes? Probably not. But I’m writing about it because it’s important! And it all comes back to the difference between a rule-bound diet mentality and eating based on internal wisdom. Serving Size: A standardized, measured amount of a food that may be determined by “typical” portion sizes from consumption surveys, convenience in measuring, nutrient content, and sizes from previous guides. This is what you see listed on a nutrition facts panel, diet plans, and the food guide pyramid. Portion Size: The amount of food YOU decide to eat. Note: these two concepts are quite different. Since nutritional content of food values dramatically, it can SOMETIMES be helpful to have a sense of how much nutrition is contained in a product. You can read here in more detail if you’re curious to know how to use nutrition information (like calorie counts) in a productive way. 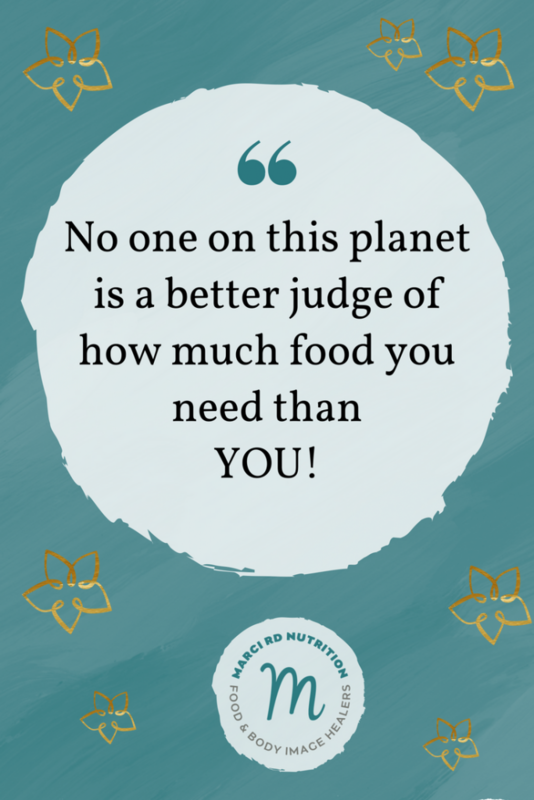 However, no one on this planet is a better judge of how much food you need than YOU! Sometimes dieting and eating disorders disrupt a person’s ability to determine how much food they need. If you have gotten used to someone else telling you how much to eat, it makes sense that you’ll have to re-learn this skill. 1. How hungry am I? 2. When will I be eating again? 4. What type of meal or snack balance do I need for my overall health? Hopefully you can feel a little more confident knowing that you don’t have to rely on any outside measurements or randomly determined serving sizes to determine how much food you can eat. If you listen, your own wisdom won’t let you down!